During summer and early fall, the rivers of New England (including the Assabet) depend on groundwater seeping slowly into the streams (baseflow) to provide the relatively cool, clean water to sustain streamflow. This summer-time baseflow is critical to maintaining good habitat for fish and other aquatic creatures and essential to keep the streams from drying up in the summer. For a description of how the water cycle affects our rivers, read Early fall on the Assabet, Sudbury and Concord Rivers by Ingeborg Hegemann. 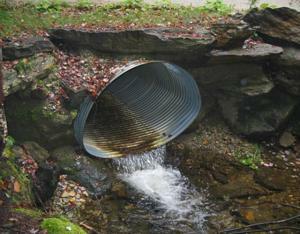 In the Assabet, Sudbury and Concord Rivers and Hop Brook, baseflow and flow from the tributaries dilute the nutrients and other pollutants in the wastewater effluent being discharged. In drier summers the proportion of effluent to baseflow in the Assabet River gets very high - as much as 80 to 90% effluent depending on the river section. For example, during the July 1999 TMDL field survey, ENSR found that 80% of the flow in the Assabet at the USGS gage in Maynard could be accounted for by wastewater effluent. Unfortunately, the watershed's tributary streams have already lost much of their baseflow because of existing groundwater withdrawals, sewering, and extensive paved and otherwise impervious surfaces where water can't infiltrate back into the aquifers. For this reason, the impacts of new or increased groundwater withdrawals from the watershed must be carefully evaluated to ensure that they will not reduce groundwater or baseflow contributions to the rivers and streams. Additional losses of these flows will exacerbate the rivers' existing eutrophication problems and undermine existing and future investments in nutrient control. Read more about the effects of impervious areas (paving) and how to improve it on our Manage Stormwater page. Go to our Water Cycle and groundwater withdrawal pages to learn more about how we affect streamflow.